Background: “Who’s on First?” is a famous 1940s routine by comedic duo Bud Abbott and Lou Costello. Abbott played the serious partner or “straight man” in the act; Costello was the comic or “funny man” of the pair. For more on this type of comic entertainment (or “double act”), click here. What you need to know (about the act): In one 6-minute version of this act, Abbott plays a baseball player (Mr. Broadhurst), and Costello plays a fool named Sebastian Dimwitty. (The word “dimwit” is slang for a stupid person, someone whose wit is not very bright.) He interrupts Abbott to ask some questions about the St. Louis baseball team. He wants to know all their names for when he visits the baseball park. What you need to know: The basic rules of baseball. Baseball is only played in a dozen countries in the world, so many U.S. immigrants are rightfully confused by this game with many rules. Offense: One player at a time holds a bat and tries to hit a pitched ball thrown by the defense; he is called the hitter or batter. 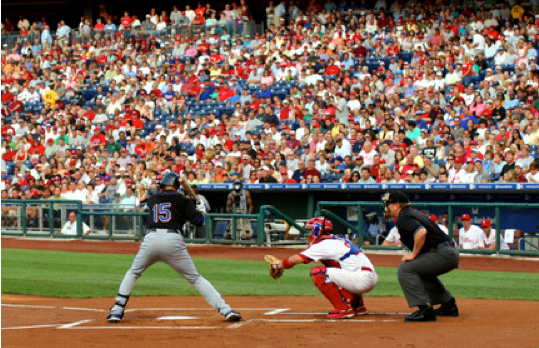 If the ball is successfully batted within the “fair” territories of the field, the runner tries to touch as many of the bases in order (first-second-third-home) as he can. If he successfully comes around to touch the 4th base (called “home plate”), his team is awarded one point. Defense: Nine players are positioned around the playing field to try to catch the batted ball. Main players: The pitcher throws the ball toward the catcher in a way that will try to fool the batter. Both the pitcher and catcher are stationed on the smaller part of the field called the infield. Other infielders: The first baseman guards the area near first base. The second baseman guards the right side of second base. The shortstop guards the left side of second base. The third baseman guards third base. Outfielders: The larger part of the field has three speedy players guarding the part of the field away from the bases and the pitching/catching action. The rightfielder guards the area behind the first and second basemen. The centerfielder guards the area behind second base. The leftfielder guards the area behind the shortstop and third basemen. What’s So Funny? This sketch is funny because Costello is innocently asking for the players’ names, and Abbott gives him names that sound like question and answer words. Costello gets increasingly confused—as does the audience, which makes it funny to watch. batter (left) in white uniform, umpire in black, catcher (crouching) in blue, pitcher (upper right) in blue. Why you need to know this: First of all, “Who’s on First?” is an important piece of American cultural history (and still very funny after 70 years). Second, you will hear this expression at work or out in the community. This expression can be used whenever the topic of conversation becomes confusing for one or all of the participants. Here’s an example. Cultural Note: At the beginning of the sketch, Bud Abbott is singing the words to the 1908 baseball song, “Take Me Out to the Ball Game.” Almost every American knows this song. The lyrics are here. A ___ walks into a bar.